The Washington Redskins (2-2) return to action Sunday (1:00 p.m.) at FedEx Field for a Week 6 matchup against the San Francisco 49ers (0-5). On paper and according to the weekly betting lines, the Redskins have a soft landing spot following their Week 6 bye. In the parity-heavy NFL, there is no such thing. In this case, there is plenty of background drama as well. Pierre Garcon, Washington’s top receiver last season, faces his former team for the first time since signing a free agent contract with San Francisco this offseason. 49ers rookie head coach and former Redskins offensive coordinator Kyle Shanahan gets a shot at revenge against the team that sent him and his father packing in 2013. 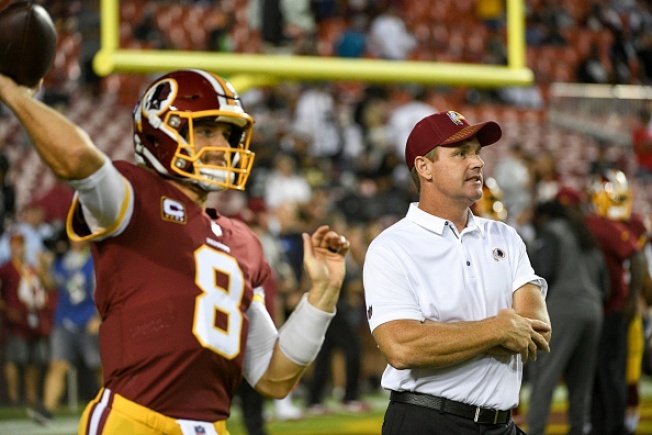 There’s also the never-ending reports that a reunion looms between Shanahan and Kirk Cousins should the Redskins quarterback actually reach free agency next offseason. Sounds like fun. Here’s a look at four other things to watch in Sunday’s matchup. The bye week, though earlier than desired, came at a nice time for the Redskins considering the injuries suffered in the 23-20 Week 4 loss at Kansas City on Monday Night Football. The break likely gave left tackle Trent Williams (knee) enough time to recover, though the Pro Bowl is listed as “questionable” after not practicing all week. Time off wasn’t enough for others. Cornerback Josh Norman (ribs) was ruled out, while starting running back Robert Kelley (ankle) and safety Deshazor Everett (hamstring) are listed as “doubtful” on the weekly injury report. Quinton Dunbar replaces Norman in the starting lineup and rookie Fabian Moreau will likely receive his most extensive NFL action. Everett’s absence would limit Washington to only three safeties unless another rookie, Fish Smithson, is activated from the practice squad. There’s no good time for injuries, but in terms of the pass defenders, this isn’t the worst of weeks. San Francisco quarterback Brian Hoyer present something of a challenge in that he’s experienced. He’s also well traveled for a reason. The 49ers entered the week tied for 29th with four touchdown passes and rank 27th with 6.2 yards per attempt average. Running back Chris Thompson has turned into arguably Washington’s top offensive playmaker this season – 7.1 yards per carry, team-high 235 receiving yards. However, the Redskins prefer limiting his workload to 25-30 snaps. That was true even when Kelley missed the Week 3 win over Oakland with a rib injury. That means rookie Samaje Perine (3.1 yards per carry) and Mack Brown will handle early down work with Kelley out. The 49ers defense allows 366.4 yards per game (28th), but they have forced a league-high six rushing fumbles. Perine has struggled with ball security early this season and won’t have a long leash even without Kelley. Despite five productive seasons, the Redskins showed little interest in retaining Garcon this offseason. Perhaps that makes sense long-term, but for now, they miss the physical wide receiver. That’s not just because Garcon ranks eighth in the league with 379 receiving yards on 28 receptions. The combination of Terrelle Pryor and Josh Doctson hasn’t come close to replacing Garcon’s steady presence. Washington also lost one of its most intense players. Without Norman, the primary coverage duties likely falls to cornerback Bashaud Breeland. The Las Vegas smart guys installed the Redskins as an 11-point favorite over the 0-5 49ers. Whether that’s fair or not, it’s certainly rare. Washington hasn’t been a double figure favorite since 2009. The winless start and the point spread hides the fact that San Francisco has lost its last four games by a combined 11 points. There is talent in their defensive front-7 in the form of three recent first round picks: defensive tackle DeForest Buckner, pass rusher Solomon Thomas and inside linebacker Reuben Foster. Offensively, running back Carlos Hyde (332 yards) ranks among the league-leaders. While Garcon is the primary receiving target, Marquise Goodwin averages an impressive 17.4 yards per catch.